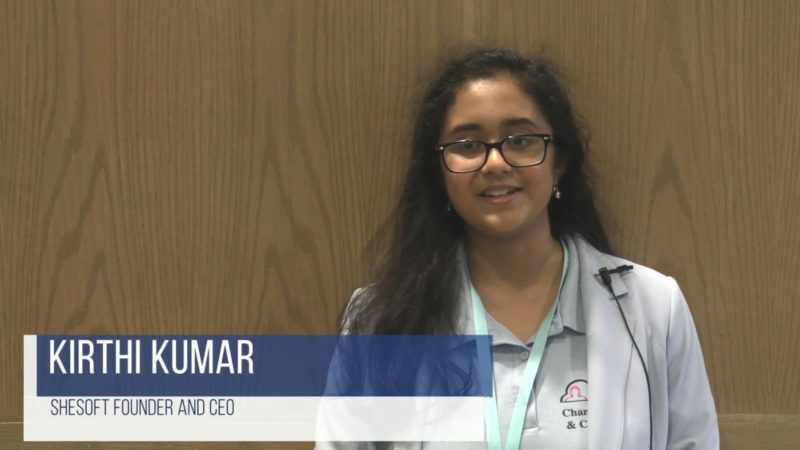 Thomas Jefferson High School for Science and Technology junior Kirthi Kumar, who received the STEM Rising Star Award at last year’s K-12 Stem Symposium, will be one of the speakers at the sixth annual 2019 K-12 STEM Symposium. The event takes place March 30 at the Nysmith School, in Herndon, Virginia. WashingtonExec spoke with Kirthi about her interest in STEM, what opportunities it brings and why girls should get involved. What first interested you in STEM? I have been very interested in STEM since I was 4 years old. The hands–on activities at Nysmith School made me very curious about STEM. My favorite to date has been wearing a spacesuit and pretending to be an astronaut when I was 4 years old. My parents nurtured my STEM interests during weekends by taking me to various museums and STEM extracurricular activities. My STEM interests continued over the years since my elementary education at Nysmith while presenting science fair and other projects supplemented with STEM championships, visiting science exhibitions, STEM competitions and conferences throughout the U.S.
You’ve competed in many STEM competitions and garnered media attention for your work. What opportunities can STEM create for students? Participating and winning awards in many STEM competitions such as ACSL, Science Olympiad, Math League and Siemens Science Fair have provided me with great learning experiences in computing. Participating in STEM competitions is the most interesting learning experience for students in the areas of research and development of solutions that benefit the local/global communities. Overall, STEM is a diverse field with many different opportunities, and I’m sure that everyone can find a passion in raw STEM, or combine their passion with STEM. Truly, the opportunities are endless to explore in the fields of medicine, engineering, applied math, chemistry, physics, programming and gaming, to name a few. Why do you think more young girls should pursue STEM? According to statistics, women represent 50 percent of the college-educated workforce in the U.S., but only 29 percent of all science and engineering positions. Girls are underrepresented in STEM for various reasons, and I urge young girls to break this stereotype so that we can see a fair gender representation in solving our local/global community problems. STEM provides various career opportunities, high-paying jobs that are in high demand, and thought-provoking challenges to solve. Hence, I think more girls should pursue STEM, so that they can pursue STEM careers and bridge the gender gap in technology. Talk a bit about SheSoft. What inspired you to found the nonprofit? What projects are you most excited for in 2019? SheSoft is a 501(c)(3) nonprofit organization dedicated to bridging the gender gap in technology by empowering young girls in upper elementary and middle school ages through seminars, webinars, workshops and software application competitions. SheSoft is using innovative methods to capture the interests of young girls by providing unique hands-on workshops and guiding them to use software to turn their ideas into projects which benefit the society. I have witnessed underrepresentation of girls in technology since middle school, and the numerous national STEM competitions and hackathons that I have participated since my middle school years. I started working toward bridging this gender gap being the founder and CEO of SheSoft. Underrepresentation of women and the lack of like–minded peers in technology-related championships inspired me to start SheSoft. SheSoft completed a successful, rewarding championship and conference during last school year. I’m super excited about our upcoming SheSoft national championship and conference for this school year, providing all upper elementary and middle school girls nationwide to participate in the championship. I am looking for pure computer science projects or the ones that intersect multiple fields like computer science and medicine, biology, environment, mechanical engineering or similar subjects. You first attended the K-12 STEM Symposium as a fifth grader. As a speaker at this year’s 2019 K-12 STEM Symposium, what topics do you hope to highlight? I was interested in computer science and engineering during my first attendance at K-12 STEM Symposium. As a junior at TJ now, I am taking courses like artificial intelligence and similar courses that enrich my STEM experience. I want to highlight how technology can be applied to build safer and smart cities/sites with recent strides in technology, computer vision, AI and machine learning. I want to talk about how engineering and technology can be applied to the areas of physics and applied math. In addition, I want to emphasize on the importance of parents to support their children to get them inspired in STEM by engaging them through STEM workshops, championships and conferences like the way my parents supported me. This year’s K-12 STEM Symposium theme is “The Power of Curiosity.” What do you see as the role of curiosity in fostering a passion for STEM? I’m so happy to see this year’s topic as “The Power of Curiosity.” This is one thing that keeps me going throughout my school years. I’m a hands-on person; I constantly want to explore, build machines and challenge the status quo in constructive ways. The role of curiosity comes with a learning and exploring mindset. It is important that the schools, leaders and organizations foster curiosity for STEM so that everyone (those who are best in STEM and not so best in STEM) learn together to build an intellectually explorative mind-sharing environment. Curiosity is essential to nurture critical–thinking skills necessary for STEM education, which is very important for the United States to maintain its position as a global leader.